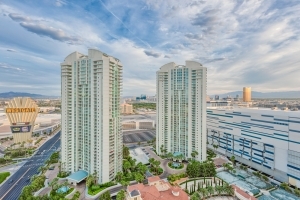 Turnberry Place is high-rise luxury living in the Las Vegas valley with 720 units that features sweeping views of the Strip, downtown Vegas and the mountains. You will experience secure resort-style living and of amenities, including access to underground parking and a lobby staffed 24 hours a day, as well as limousine, valet and concierge services. Residents can fresh and renew at each of the towers' resort-style swimming pools! The four 38-story condominium towers, stretches 477 feet into the sky.